I can't believe that it's been over two months since my last post! The thing is, I haven't really made too many recipes that I deemed blog-worthy as of late. And of course, I only want to share the BEST. And the easiest. And the tastiest. Well, last night's easy-peasy budget-friendly dinner had my tastebuds screaming for more. So, naturally, when something ridiculously tasty is also ridiculously simple, I know that it is time to blog! 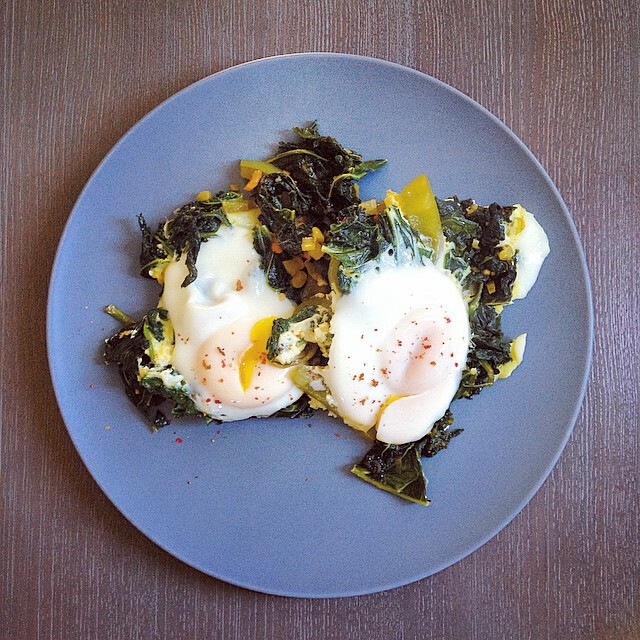 I used a technique that I'd never tried before - poaching eggs on top of a bed of greens. No water needed here - these eggs were cooked by the magic of steam. 1 generous handful of spinach. method Sautée garlic & butter over medium. When it starts to sizzle & wilt, add the green pepper. Move it all around with spatula and continue cooking until pepper begins to soften. Now, add all of the greens - it will look like it's going to overflow in your pan, but that's good - it'll wilt down quickly. Sprinkle with Montreal Steak Spice (I buy the salt-free kind) and add a tsp of your favourite red chili paste (I used La Bombetta). Cook, moving around with spatula, until greens are wilted, about 4 minutes. Crack eggs, one by one on top of greens mixture. Cover the pan (I don't own a pan cover, so I used a large pizza tray - fits perfectly!) turn heat to the lowest setting, and sit for about 6 to 8 minutes, or until whites are set and yolks are still a lil soft. Serve immediately, on it's own, or with toast!